AFC Fylde close to sealing a deal? AFC Fylde are expecting to strengthen their ranks with at least one new signing ahead of their first pre-season friendly tomorrow. The Coasters, who welcome Championship neighbours Preston North End to Mill Farm for a 3pm kick-off, have brought in four new players so far this summer. Luke Burke rejoined the club last month following his successful loan from Wigan last season, joining Neill Byrne, Ryan Croasdale and Russell Griffiths in putting pen to paper with Dave Challinor’s men. The Fylde boss is confident the club can seal some more acquisitions in the not-too-distant future. Challinor said: “We hope to have a couple of deals wrapped up before the weekend. If not, then they should be completed just after. “We know where we want to be with squad numbers and we need ones who are going to challenge that first 11. “I’m confident we can get one of them done before the Preston game on Saturday, but there are two or three we are speaking to in terms of permanent and loan signings. “We’ve had some trialists in and they’ve done well, but at this moment in time we’re looking at players who can challenge for our first team. The Coasters returned to the Fylde coast this week following their pre-season training camp in Scotland, which proved to be a valuable trip for Challinor. “It was a really good exercise and we got lots of good work in,” he added. “We’re back here now but the hard work hasn’t stopped. We did some fitness work on the dunes in Blackpool on Wednesday. “Up until now we’ve done most of our work with the footballs, so this was our last real opportunity to focus solely on our fitness. Fylde’s friendly against Preston tomorrow will be followed up by a trip to neighbours Squires Gate next Tuesday. 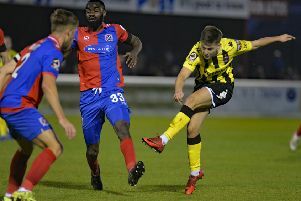 Further home games against Carlisle United (July 21) and Blackpool (July 24) follow before Fylde finish their preparations with an away game at Curzon Ashton (July 28).